My preschooler E is in her second-year at the Montessori school, and they are learning about world cultures and traditions. So while I would have jumped at the chance to get free tickets to see Disney's "Moana" in an advance-screening anyway, it was a particularly appropriate treat for us right now. 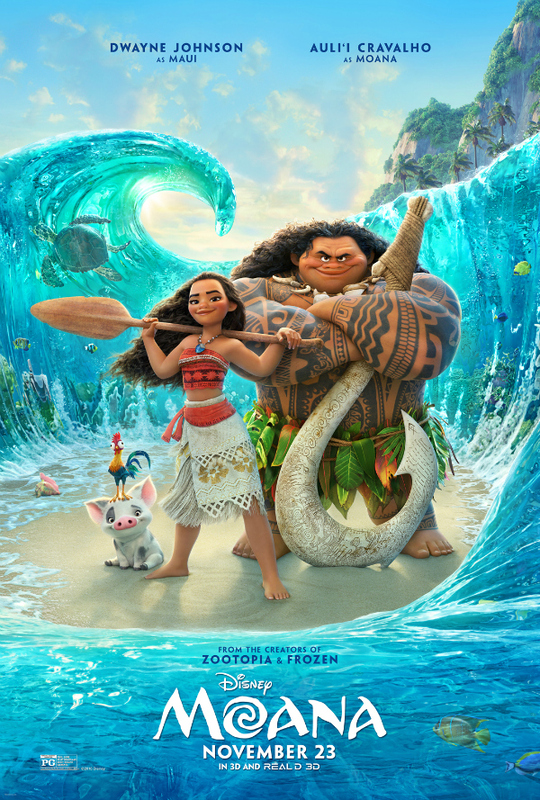 This movie was full of stories and history and culture of the people of the Pacific Islands, and this movie is a fabulous resource to expose children to its beauty and richness. Plus once again, Disney knocks it out of the park! "Moana" is about a girl named - you guessed it - Moana who is compelled by the water surrounding their island, but who is always kept away for her safety. One day she manages to toddle down to the beach and is "chosen" by some sort of magic. When she is grown and her people start to experience a blight, she learns secret about her tribe's history and is convinced she must leave the safety of their reef to find the god Maui to save her people. Her journey is filled with humor, love, tolerance, respect, and acceptance. My only problem with this movie was the visit to Tamatoa's lair. In a film rich with Pacific Islander culture and history and songs and language, it was very dissonant both visually and aurally to have a psychedelic black-lit 60's scene and song reminiscent of David Bowie. This was also the only part my preschooler E (she'll be 5 in a month) found scary. I definitely recommend this movie for adults and children alike, and E is already making plans to buy it on DVD!